December attendance numbers are in. 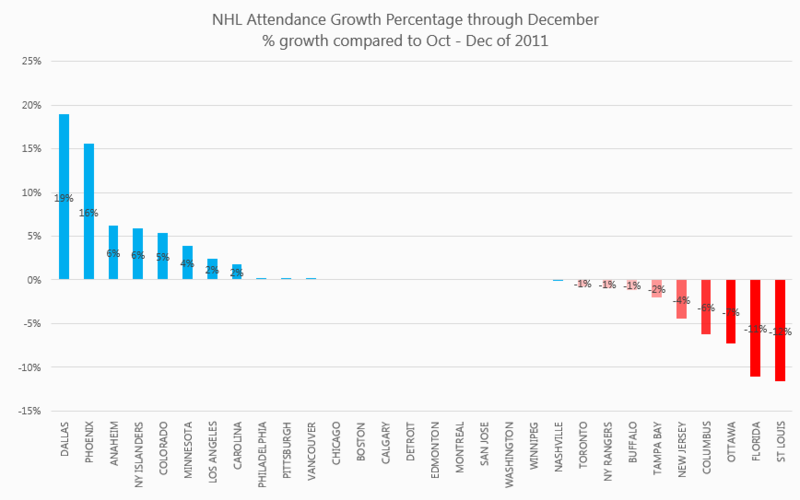 As a whole, NHL attendance was relatively flat for December when comparing to December of 2011. 10 teams had declines from December of 2011 while only 4 teams had increases. St. Louis, Florida & Columbus are down double digits and only the Islanders & Coyotes were up double digits in December. When looking at the first three months though December, NHL Attendance is still up 1% which is very good considering half the teams have been at max capacity for a while leaving very little room to grow. Dallas and Phoenix continue to be the stalwarts of growth compared to fall of 2011, up 19% and 16% respectively. As fans of these teams will admit, this is largely due to the fact that both teams had the most room to improve. Regardless, growth and progress should be commended as turnarounds don’t happen overnight. St. Louis continues to struggle with a decline of 12% from 2011. If it is any consolation, St. Louis is still averaging 16.7K per game and is 19th in the league in total attendance which is still a healthy number. Going back further, St. Louis has some of the highest variability from season to season in the league. In 06-07 they averaged only 12,521 but peaked 4 years later at 19,150. If there are any St. Louis locals with some theories on why the drop, I am all ears. Below is little more analysis on some of the more interesting attendance stories in the league. From an opponent perspective, the Coyotes will suffer a bit from reduction in Red Wings visits to Glendale. They have not seen some of the heavy hitters come through their barn. Specifically, Boston, Philly and Pittsburgh are some of the bigger draws for the Coyotes games and are all schedule to come in the second half of the season. The Flyers did visit Glendale on the 4th of January and attendance was right at their 3 year average with 14,875. Looking ahead at January, it might be a little light month with several lighter draw teams coming to town: Calgary, New Jersey & Toronto go through Phoenix in January. If you look at the game # by game # basis you can see they are trending higher. It is very interesting looking at the Dallas Stars dashboard compared to the Coyotes. Both seeing growth but their data tells two different stories. The Coyotes, are seeing the highest attendance over the last 4 years in every month of the year. Meanwhile, Dallas is still below 2009-10 numbers and their December attendance was the lowest in 4 years. The biggest surprise on the Dashboard is the low attendance for the Flyers game. Just 8,567 compared to a historical average of 16,357 when the Flyers are in town. I looked into that game. The game was played on December 7th, a Saturday. Which was also the same day as the Texas – Baylor football game which probably diverted a healthy amount of Texans attention. As the graph suggest, the Panthers continue to struggle at the gate. The caveat here is that the Panthers were sold to Vincent Viola in the September. Low attendance is fairly consistent with any ownership changes as transitions are rarely seamless. The rough comparable would be the Dallas Stars in the Fall of 2011. Tom Gaglardi finalized the purchase of the Stars in November in 2011 and the fall of 2011 proved to be the worst attendance on record. The Panthers were not nearly as dire as the Dallas Stars situation but you should expect Florida to bounce back a bit next year. I can go on and on with this attendance stuff but not sure you readers want to hear me ramble on an on. If you have any request, please let me know and I can follow up with a separate blog entry. It’s refreshing to see pure numbers presented by a non-Coyotes fan re: the Coyotes and that the trend is up. The reason nobody showed up to the Flyers game was because there was a massive ice storm and Texans don’t like to drive on ice. Had nothing to do with the football game. only 10,000 at the Coyotes game the other night, more like 6 to 7,000 from what a friend told me that lives down there.I wonder if the coyotes numbers are skewed some how?